"Composition C (No.III) with Red, Yellow and Blue" (1935) by Piet Mondrian. Oil on canvas. You’ve probably seen this painting before, or one like it. You can see Composition C (No. III) in Tate Britain, alongside several other abstract works. This is probably what lots of us think of when someone talks about modern art, and it’s hard to see how it could mean anything or be designed to express anything. But when you see what’s going on here, I actually think this piece is, at the same time, charmingly optimistic, but also pretty sad. Mondrian began working around the very beginning of the 20th century, and his work appears to have been influenced by the impressionism, and the bold use of colour employed by fauvist painters like Matisse and Gauguin. Prior to the First World War, Mondrian’s work was still fairly representational, but it already showed hints of the abstraction for which he would become best known. But it was the outbreak of war which seemed to change Mondrian’s work forever. And Composition C (No. III) is a good example of how he responded to the political and social consequences of the war through his work. Imagine the Europe Mondrian found himself in. Millions had given their lives for the sake of “peace”, and many millions more lay wounded. It was the war to end all wars – the world had never seen conflict on such a scale, and the thought that the world might see such a thing again was unthinkable. Everything had changed, from politics and government to home and family life. Decades of apparent progress had crashed to a halt, and the war had show that the savage aspects of human nature were far from over. With all of that in mind, look again at Mondrian’s picture. As I sat and looked at it hanging in Tate Britain, the thing that’s striking is the sense of balance. The primary coloured blocks, clearly outlined in black and surrounded by white, are arranged perfectly. Although they are different sizes, one doesn’t see to dominate the others. And there are no distractions. The image is simple and clean, and in a way it is calm and quiet. You can take it all in fairly easily. There’s nothing confusing or provocative. Composition C is pure and peaceful, and the different elements fit together in harmony and balance. 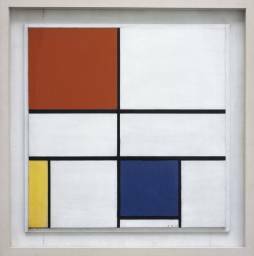 All of which stands in sharp contrast to the situation raging around Mondrian as he painted this piece, and others like it. And that is why it is both hopeful and sad. Mondrian tried to paint what was so obviously lacking in the world. With these simple colours and shapes, Mondrian was trying to imagine a better world. He saw that it was possible, and he’s calling you to yearn, like he did, for a world where the same balance and harmony exists in real life. But it is also desperately sad. This is a cry of despair in the face of a world which seemed to be spiralling out of control. And, as we look around at the world and compare it to Mondrian’s idyllic version of the future, have we really come much further. Although this picture might be calm and balanced, it is borne out of a world, and an experience of the world, which was anything but calm. It’s a feeling most of us can probably identify with. We can feel what Mondrian felt as we look at the world. But we should also see the gap between the world as it was, and the world Mondrian painted. And the only appropriate response, surely, is despair… unless we can know that the world is heading somewhere, and that there will be an end to the unrest and pain that we see around us. Les Fauves apparently means “The Wild Beasts” – their painting basically looked a bit crazy compared to what had gone before, particularly it’s use of bright and bold, although unrealistic, colour. It looks quite primitive compared to more representational earlier stuff, and it starts to get a bit abstract. When you get to Mondrian, he’s taken abstraction and use of colour much further. Loving the little nuggets of art history! Apparently he was into Theosophy – ‘arts, religions and science will lead us to enlightenment’. And this painting is part of that gospel – “a ‘dynamic equilibrium’, which he hoped would work on the individual spirit and have wider social implications” (Tate). Which sounds like the whole modernist idea, I guess.